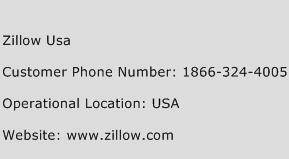 The email address of Zillow USA is info@zillow.com. The Website of Zillow USA is www.zillow.com. I would like someone from your company to contact be by phone 304-524-7939. I bought my home and property in 2013. The property is still posted on www. Truilia.com with full directions to my home. I have interested people driving to my home, taking photos of my home and me sitting on my porch. I have called every available number listed on the internet to speak to someone to no avail. My house and property are NOT for sale. It is posted property (no trespassing/beware of dog/POSTED) yet I still have interested people driving to my private residence and breaking the law by coming onto my property and to my home and taking photographs. Someone please contact me ASAP to remedy this situation. Although above on this complaint page you give a customer care number of 1-866-4005 the only real person I had contact with was someone in advertising department even though I picked option 3. Thanks. Zestimate dropped by $100, 000 in one day when real estate agent updated status and added photos - Zestimate value dropped from $807, 000 to $715, 000. This is hurting our sale. "Request Review" is not working and says the server is down. Please review homes on the same street and increase the Zestimate back to $800, 000.